Radiotelegraphy using Morse code, also known as "CW" from "continuous wave", is the wireless extension of land line (wired) telegraphy developed by Samuel Morse and dates to the earliest days of radio. Although computer-based (digital) modes and methods have largely replaced CW for commercial and military applications, many amateur radio operators still enjoy using the CW mode—particularly on the shortwave bands and for experimental work, such as earth-moon-earth communication, because of its inherent signal-to-noise ratio advantages. Morse, using internationally agreed message encodings such as the Q code, enables communication between amateurs who speak different languages. It is also popular with homebrewers and in particular with "QRP" or very-low-power enthusiasts, as CW-only transmitters are simpler to construct, and the human ear-brain signal processing system can pull weak CW signals out of the noise where voice signals would be totally inaudible. A similar "legacy" mode popular with home constructors is amplitude modulation (AM), pursued by many vintage amateur radio enthusiasts and aficionados of vacuum tube technology. Demonstrating a proficiency in Morse code was for many years a requirement to obtain an amateur license to transmit on frequencies below 30 MHz. Following changes in international regulations in 2003, countries are no longer required to demand proficiency. The United States Federal Communications Commission, for example, phased out this requirement for all license classes on February 23, 2007. 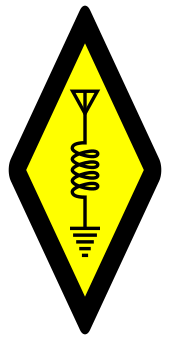 All countries that license citizens to use amateur radio require operators to display knowledge and understanding of key concepts, usually by passing an exam; however, some authorities also recognize certain educational or professional qualifications (such as a degree in electrical engineering) in lieu thereof. The licenses grant hams the privilege to operate in larger segments of the radio frequency spectrum, with a wider variety of communication techniques, and with higher power levels relative to unlicensed personal radio services (such as CB radio, FRS, and PMR446), which require type-approved equipment restricted in mode, range, and power. Amateur licensing is a routine civil administrative matter in many countries. Amateurs therein must pass an examination to demonstrate technical knowledge, operating competence, and awareness of legal and regulatory requirements, in order to avoid interfering with other amateurs and other radio services. A series of exams are often available, each progressively more challenging and granting more privileges: greater frequency availability, higher power output, permitted experimentation, and, in some countries, distinctive call signs. Some countries, such as the United Kingdom and Australia, have begun requiring a practical training course in addition to the written exams in order to obtain a beginner's license, which they call a Foundation License. In most countries, an operator will be assigned a call sign with their license. In some countries, a separate "station license" is required for any station used by an amateur radio operator. Amateur radio licenses may also be granted to organizations or clubs. In some countries, hams are allowed to operate only club stations. An amateur radio operator uses a call sign on the air to legally identify the operator and/or station. In some countries, the call sign assigned to the station must always be used, whereas in other countries, the call sign of either the operator or the station may be used. In certain jurisdictions, an operator may also select a "vanity" call sign although these must also conform to the issuing government's allocation and structure used for Amateur Radio call signs. Some jurisdictions require a fee to obtain such a vanity call sign; in others, such as the UK, a fee is not required and the vanity call sign may be selected when the license is applied for. The FCC in the U.S. discontinued its fee for vanity call sign applications in September 2015. 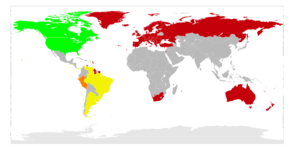 Many countries do not follow the ITU convention for the numeral. In the United Kingdom the original calls G0xxx, G2xxx, G3xxx, G4xxx, were Full (A) License Holders along with the last M0xxx full call signs issued by the City & Guilds examination authority in December 2003. Additional full licenses were originally granted in respect of (B) Licensees with G1xxx, G6xxx, G7xxx, G8xxx and 1991 onward with M1xxx calls. The newer three level Intermediate licensees are 2E1xxx and 2E0xx and basic Foundation license holders are granted a M6xxx or M3xxx call signs. In the United States, for non-Vanity licenses, the numeral indicates the geographical district the holder resided in when the license was issued. Prior to 1978, US hams were required to obtain a new call sign if they moved out of their geographic district. In Canada Call signs start with VA, VE, VY, VO, and CY. All Call signs starting with all prefixes end with a number after to indicate the political region *(Except CY which indicates geographic islands) (VA/VE1 is Nova Scotia, VA/VE2 is Quebec, VA/VE3 is Ontario, VA/VE4 is Manitoba, VA/VE5 is Saskatchewan, VA/VE6 is Alberta, VA/VE7 is British Columbia, VE8 is the NWT, VE9 is New Brunswick, VY0 is Nunavut, VY1 is the Yukon Territory, VY2 is P.E.I, VO1 is Newfoundland and VO2 is Labrador) CY is for amateur who go to Stable and/or St. Paul's Island (which both require coast guard permission to get to) CY0 is Stable Island and CY9 is St. Paul's Island. The last two/three letters of the callsigns is typically the Operator's Choice where upon completing the test write their three most preferred options **(two letter callsign suffixes require a ham to be of 5 years of already being licensed). Callsigns in Canada can be requested with a fee. Also, for smaller entities, a numeral may be part of the country identification. For example, VP2xxx is in the British West Indies (subdivided into VP2Exx Anguilla, VP2Mxx Montserrat, and VP2Vxx British Virgin Islands), VP5xxx is in the Turks and Caicos Islands, VP6xxx is on Pitcairn Island, VP8xxx is in the Falklands, and VP9xxx is in Bermuda. In most administrations, unlike other RF spectrum users, radio amateurs may build or modify transmitting equipment for their own use within the amateur spectrum without the need to obtain government certification of the equipment. 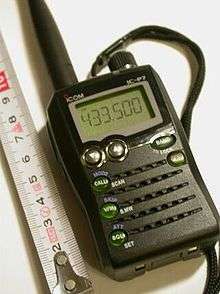 Licensed amateurs can also use any frequency in their bands (rather than being allocated fixed frequencies or channels) and can operate medium to high-powered equipment on a wide range of frequencies so long as they meet certain technical parameters including occupied bandwidth, power, and maintenance of spurious emission. The amount of output power an amateur radio licensee may legally use varies from country to country. Although allowable power levels are moderate by commercial standards, they are sufficient to enable global communication. Power limits vary from country to country and between license classes within a country. For example, the peak envelope power limits for the highest available license classes in a few selected countries are: 2.25 kW in Canada, 1.5 kW in the United States, 1.0 kW in Belgium, Luxembourg, Switzerland and New Zealand, 750 W in Germany, 500 W in Italy, 400 W in Australia, India and the United Kingdom, and 150 W in Oman. Lower license classes usually have lower power limits; for example, the lowest license class in the UK (Foundation licence) has a limit of 10 W. Amateur radio operators are encouraged both by regulations and tradition of respectful use of the spectrum to use as little power as possible to accomplish the communication. This is to minimise interference or EMC to any other device. Sub-mm Some administrations have authorized spectrum for amateur use in this region. 1 This is not mentioned in the ITU's Table of Frequency Allocations, but individual administrations may make allocations under Article 4.4 of the ITU Radio Regulations. See the appropriate Wiki page for further information. 2 HF allocation created at the 1979 World Administrative Radio Conference. These are commonly called the "WARC bands". 3 This includes a currently active footnote allocation mentioned in the ITU's Table of Frequency Allocations. These allocations may only apply to a group of countries. ↑ "International Radiotelegraph Convention (Washington, 1927)" (PDF). Retrieved 26 April 2015. ↑ Sumner, David (August 2011). "How Many Hams?". QST. American Radio Relay League. p. 9. ↑ Gernsback, H (May 1909). First Annual Official Wireless Blue Book of the Wireless Association of America (PDF). New York: Modern Electrics Publication. Retrieved 2009-06-19. ↑ "''THE INFLUENCE OF AMATEUR RADIO ON THE DEVELOPMENT OF THE COMMERCIAL MARKET FOR QUARTZ PIEZOELECTRIC RESONATORS IN THE UNITED STATES.'' (1996) By Patrick R. J. Brown, Hewlett Packard Company, Spokane Division". Bliley.net. Retrieved 2012-11-22. ↑ "Inventor of IC 'chip', Nobel Prize Winner Jack S. Kilby Credits Amateur Radio for His Start in Electronics". Nobelprize.org. 2005-06-20. Retrieved 2012-11-22. ↑ Jim Taylor. "Canadian Amateur Radio Bulletin, ''Amateur Radio "Saved Lives" in South Asia'' (2004-12-29)". Hfradio.net. Archived from the original on March 6, 2012. Retrieved 2012-11-22. ↑ "What is Ham Radio?". ARRL.org. Archived from the original on 4 May 2010. Retrieved 2010-06-01. ↑ Weaver, Bruce D. (January 2003). "On the Air Learning". Teaching Pre K-8. 33 (4): 50–51. ISSN 0891-4508. ↑ "Ham Fisted", QST, August 1972, p83. ↑ Brady, Jasper Ewing (1899). Tales of the telegraph. Doubleday & McClure Co. Retrieved February 1, 2013. ↑ "Ham Radio History". Arrl.org. Retrieved April 17, 2015. ↑ "Telegraph Talk and Talkers-slang extract (1902)". Earlyradiohistory.us. Retrieved April 17, 2015. ↑ "I am the Wandering Ham "pome" (1920)". Earlyradiohistory.us. Retrieved April 17, 2015. ↑ "Ham Radio Frequently Asked Questions". ARRL.org. Archived from the original on 6 May 2010. Retrieved 2010-05-23. ↑ "FCC Report and Order 06-178A1" (PDF). Federal Communications Commission. 2006-12-19. p. 7. Retrieved 2007-05-16. ↑ Federal Communications Commission (2007-01-24). "47 CFR Part 97" (PDF). Federal Register. Washington, D.C.: Government Printing Office. 72 (15): 3081–3082. Retrieved 2007-12-18. ↑ "FCC to Drop Morse Testing for All Amateur License Classes". ARRL.org via UnwiredAdventures.com. 2006-12-15. Retrieved 2010-05-17. ↑ "KH6BB USS Missouri Radio Room Photos". KH6BB USS Missouri Battleship Radio Room, kh6bb.org. Retrieved 2010-05-23. ↑ Valdes, Robert (2001-05-09). "HowStuffWorks: Use of VoIP in Amateur Radio". Communication.howstuffworks.com. Retrieved 2012-11-22. ↑ Taggart, Ralph E (April 1993). "An Introduction to Amateur Television" (PDF). QST via ARRL.org. pp. 19–23. Archived from the original (PDF) on June 5, 2007. ↑ Holmstead, Stephen (30 December 1994). "Amateur Satellite FAQ". The Radio Amateur Satellite Corporation. Retrieved 14 March 2010. ↑ Taylor, Joe (December 2001). "WSJT: New Software for VHF Meteor-Scatter Communication" (PDF). QST via ARRL.org. pp. 36–41. Archived (PDF) from the original on January 28, 2010. ↑ "ARISS: Amateur Radio on the International Space Station". ARRL.org. Archived from the original on 11 January 2007. Retrieved 2007-01-10. ↑ Jurrens, Gerald. "Astronaut (and Former Astronaut) Hams". gjurrens at Tellurian.com. Archived from the original on 30 December 2006. Retrieved 2007-01-10. ↑ Haag, Jerry. "Principles of Amateur Radio Net Control". SCC-AREA-RACES.org. Retrieved 2007-01-10. ↑ "Amateur and Amateur-satellite service". International Telecommunication Union. Archived from the original on 22 August 2010. Retrieved 2010-08-16. ↑ brweb (2000-05-01). "''International Telecommunication Union'', Minimum Qualifications For Radio Amateurs". Itu.int. Retrieved 2012-11-22. ↑ "Amateur radio licensing in Thailand – sect. Equipment license". The Radio Amateur Society of Thailand 7 August 2010. Retrieved 13 February 2011. 1 2 3 "Amateur Licensing Examinations". Federal Communications Commission. ↑ "285 TechConnect Radio Club". Na0tc.org. Retrieved 2012-11-22. ↑ "ARRL Mentor Program". ARRL.org. Archived from the original on 2007-10-14. ↑ Wilson, Mark J; Reed, Dana G (2006). The ARRL Handbook for Radio Communications 2007 (84th ed.). Newington, CT: American Radio Relay League. ISBN 0-87259-976-0. ↑ "Amateur Radio (Intermediate) License (A) or (B) Terms, Provisions and Limitations Booklet BR68/I". ↑ "Amateur Radio (Intermediate) License (A) or (B) Terms, Provisions and Limitations Booklet BR68/I". Ofcom.org.uk. Retrieved 2007-06-02. ↑ "Common Filing Task: Obtaining Vanity Call Sign". FCC.gov. Retrieved 2007-06-02. ↑ "Vanity Call Sign Fees". ARRL.org. Retrieved 2015-09-28. ↑ "UK Amateur Radio Call Signs (callsigns)". Electronics Notes. 2016. Archived from the original on 17 October 2016. Retrieved 17 October 2016. ↑ "License Search". Universal Licensing System. US Federal Communications Commission. Archived from the original on 22 August 2010. Retrieved 29 August 2010. ↑ "Famous Radio Amateurs 'Hams' & Call Signs". Bedworth Lions Club. Retrieved 29 August 2010. 1 2 "ARRL Web: Amateur Radio License Plate Fees". Archived from the original on 2007-08-04. 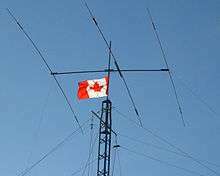 ↑ "Ham Radio Callsign License Plates (Canada)". Archived from the original on 7 December 2008. Retrieved 2008-12-04. ↑ "ICBC – HAM radio plates". Archived from the original on 19 October 2008. Retrieved 2008-12-03. ↑ OFTA, Equipment for Amateur Station: Radio amateurs are free to choose any radio equipment designed for the amateur service. 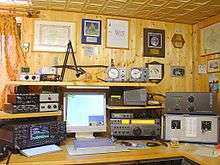 Radio amateurs may also design and build their own equipment provided that the requirements and limitations specified in the Amateur Station Licence and Schedules thereto are complied with. Archived October 14, 2007, at the Wayback Machine. ↑ "FCC.gov, About Amateur Stations. 'They design, construct, modify, and repair their stations. The FCC equipment authorization program does not generally apply to amateur station transmitters.'". Wireless.fcc.gov. 2002-02-19. Retrieved 2012-11-22. ↑ "Australian Radio Amateur FAQ". AMPR.org. June 24, 2006. Archived from the original on July 18, 2008. ↑ Industry Canada (September 2007). "RBR-4 – Standards for the Operation of Radio Stations in the Amateur Radio Service, s. 10.2". Government of Canada. Retrieved 21 January 2013. ↑ "FCC Part 97 : Sec. 97.313 Transmitter power standards". W5YI.org. Retrieved 2010-08-27. ↑ "FCC Part 97 : Sec. 97.401 and 97.403 Emergency Communications". Retrieved 2012-06-21. Amateur radio licensing in India. Retrieved Aug. 13, 2007. Bergquist, Carl J (May 2001). Ham Radio Operator's Guide (2nd ed.). Indianapolis: Prompt Publications. ISBN 0-7906-1238-0. Poole, Ian D (October 2001). HF Amateur Radio. Potters Bar, Hertfordshire, England: Radio Society of Great Britain. ISBN 1-872309-75-5. Rohde, Ulrich L; Whitaker, Jerry C (2001). Communications Receivers: DSP, Software Radios, and Design (3rd ed.). New York City: McGraw-Hill. ISBN 0-07-136121-9.